To borrow from Roy Scheider’s solemn line after his first glimpse of that really big fish in the movie, “Jaws” — we’re going to need a bigger theatre. 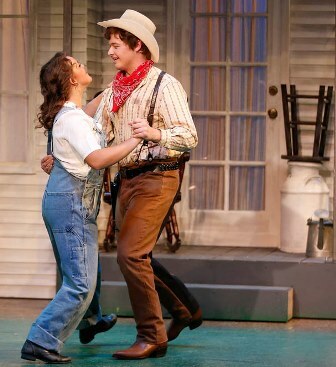 There’s no shortage of square dancing and fun in the College of Fine Arts and Production’s big musical, “Oklahoma!,” which opens Friday in Ethington Theatre. The five main stage plays presented by Grand Canyon University’s College of Fine Arts and Production this school year in Ethington Theatre were virtually sold out or oversold. And with COFAP’s growing reputation for productions that are high-quality and low-cost (free to students, in fact), demand for tickets to future dramas, musicals and operas in the 311-seat theatre shows no sign of slowing. The box-office smash, a love story about cowboy Curly McLain and his farm girl, Laurey Williams, debuted on Broadway in March 1943 and was made into a movie in 1955. The Academy Award-winning film has ties to Arizona — it was filmed mostly in southern Arizona, in Nogales, Elgin and Green Valley. Dancing, singing, costumes, sets — “Oklahoma!” is a treat for theatregoers. Directed by COFAP instructor Michael Kary, a recent inductee into the 2015 GCU Alumni Hall of Fame, “Oklahoma!” is a big production that uses more than 100 students in the cast, chorus, orchestra and crew. It’s perfect for the College and its students, Kary said. The show was choreographed by Susannah Keita, director of COFAP’s Dance Department. Other major behind-the-scenes roles are held by pianist Mark Fearey (musical director), Bill Symington (scenic design), COFAP Dean Claude Pensis (lighting design), Nola Yergen (costume design) and Kay Gray (hair and makeup design). 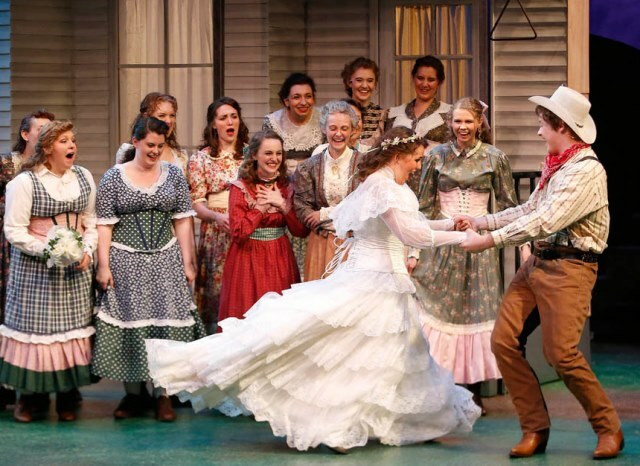 Based on the play, “Green Grow the Lilacs,” and set in 1906 in the territorial Midwest, “Oklahoma!” the musical is a toe-tapping favorite among older audiences (is “Ohhhhhh-K-la-homa!” stuck in your head yet?). In terms of theatre instruction, it has a lot to offer student performers, including the chance to learn to do-si-do. People surely will say that Oklahomans Laurey Williams (Allie Gibbs) and Curly McLain (Alexander Dubois) are in love. Another unusual aspect of this production is that many of GCU’s stellar senior actors and singers can be found in an ensemble that will blow your socks off. This has enabled many new faces in the college to step up and shine. Sophomore Allie Gibbs, who transferred to GCU this semester, was cast as Laurey. In just 11 weeks on campus, Gibbs feels more comfortable on the Ethington stage due to her theatre training and the warm welcome and helpful attitude of the COFAP faculty and students. Portraying Laurey has helped Gibbs learn about herself. 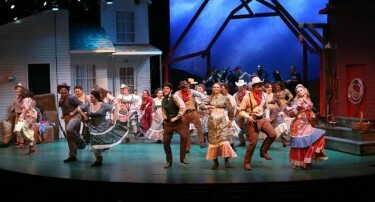 Senior Gavin Ely, who plays the affable Will Parker in “Oklahoma!,” is a veteran of song and stage at GCU. Ethington patrons will recognize the sweet voice and countenance of veteran singer/actor Gavin Ely, cast as Will Parker, a young man in love with the flirtatious Ado Annie (senior Devyn Garrett). 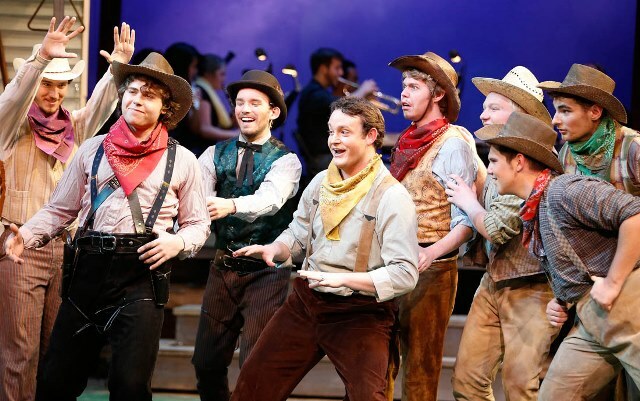 This is the fifth Ethington main stage performance for Ely, a senior vocal performance major who played a different role in “Oklahoma!” while a student at Glendale’s Apollo High. Ely, 26, said its plot is refreshingly simple, but Rodgers and Hammerstein made the music richly layered.